Individuals with invisible conditions, such as chronic migraine disorders, bipolar disorders, or chronic fatigue syndrome, face unique challenges in the workplace. Invisible conditions—those in which the symptoms are not immediately apparent to other people—may significantly limit daily activities. Yet, because they are not always obvious to the onlooker, employers may not understand the severity of the condition. 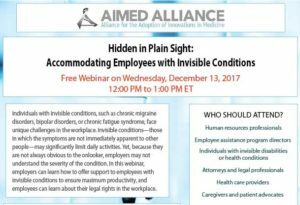 In this webinar, employers can learn how to offer support to employees with invisible conditions to ensure maximum productivity, and employees can learn about their legal rights in the workplace. Join our speakers in examining invisible conditions, the potential impacts of improper treatment or accommodation, the legal landscape protecting employees, and recommendations for employers to assist employees in receiving appropriate care.